1. Harsh, irritating, or caustic: The politician's abrasive remarks angered the audience with some of them yelling their own abrasive comments back at him. 2. Describing something that scrapes; rough or scratchy: William was advised to use sandpaper or some other abrasive material to remove the paint from the chairs before painting them again. The abrasive effect of sandpaper on the wood made it smooth and easy to paint on. 3. A reference to something that is harsh, irritating, or rude: When the talk-show host used abrasive remarks, he insulted many in his radio audience. © ALL rights are reserved. 1. To shorten; to make shorter, to cut short in its duration, to decrease the duration of; originally of time, or things occupying time: Patricia wants to abridge the long essay into a shortened, easily read format. Taking a shortcut in the city abridges the time the couple needs to get to the city in time for the concert. The doctor is abridging his discussion about the operation because the audience appears to be tired or bored. Bryan will abridge his original speech from five pages to just one page. 2. To abbreviate words, while retaining the sense and substance of the written text; to condense, to epitomize: The book was abridged to a more readable length. Within the past few years, publishers have found it necessary to abridge many classics in order to attract a greater reading public. 3. To produce by summarizing a larger work to a condensed form: The mayor agreed to abridge his comments to accommodate the featured speaker's schedule. 4. To curtail, to diminish rights, privileges, advantages, or authority: No one should be able to abridge your legal rights. 5. 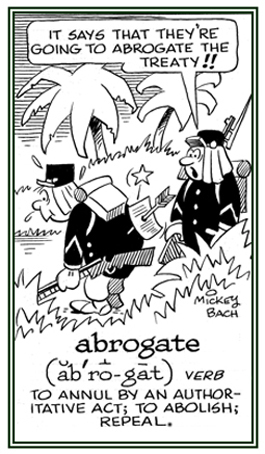 Etymology: from Middle English abregen and Old French abregier, abreger, "to shorten"; from Latin abbreviare, "abbreviate"; from Latin ab-, "from, away from" +breviare, "to shorten". 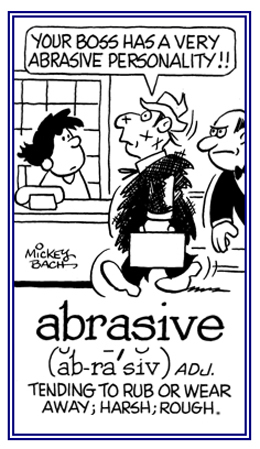 Abridge and abbreviate both carry the idea of shortening so that what remains adequately represents the whole. 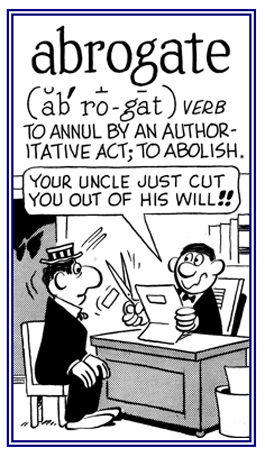 To abridge suggests the "cutting away" of nonessentials while keeping the essential meanings. To abbreviate is generally used in reference to words or phrases, or it implies shortening by the compression or omission of parts while the remainder stands for the whole; in other words, to abridge a novel for its inclusion in a magazine. by S.I. Hayakawa; Harper & Row, Publishers; New York; 1968; page 546.
so you can see more Mickey Bach illustrations. 1. The act or process of reducing; a shortening of time or labor; a curtailment of privileges: The city council voted for an abridgment of the mayor's power. 2. A compendium of a larger work, with the details and less important things omitted, but retaining the sense and substance; an epitome, or abstract: Did you see the new abridgment of Gibbon's Roman History? The professor really liked the abridgment of the latest novel by his favorite writer that was published in the newspaper. 3. 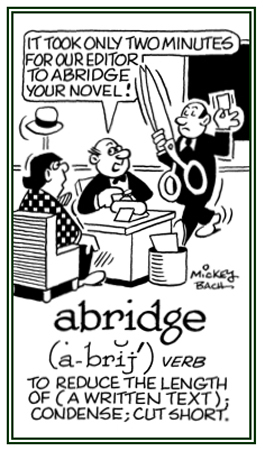 Etymology: Abridgment, or abridgement was borrowed from Old French abregement, from abregier, "to shorten, to diminish"; from Latin abbreviare, "to make short". 1. To abolish or to annul by authority; to nullify, to cancel: Congress once passed laws prohibiting the sale of liquor in the U.S.; however, the 20th Amendment to the Constitution abrogated those laws and now alcohol may be legally sold. The Secretary of State declared that further aggressive action by a certain foreign power would cause the government to abrogate the treaty it had made with that country. Mr. Jackson and the Board of Directors at the museum decided to abrogate entrance fees for senior citizens. 2. To repeal, to eliminate, or to get rid of something formally and publicly; especially, a law: The king decided to abrogate the old law regarding poaching during the summer holidays. The new law abrogated the old law about paying parking fines. They will be abrogating the decision to increase student grants after the next election. 3. 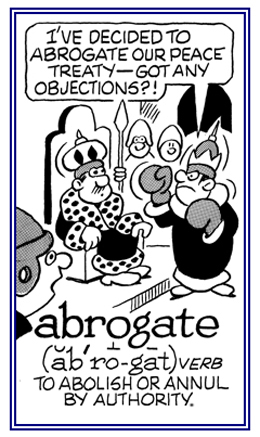 Etymology: from Latin ab-, "away" + rogare, "to ask, to propose". © ALL rights are reserved. 1. Ending suddenly; jerky and disconnected; unexpected, surprising: The car came to an abrupt stop at the railroad crossing. The open-air concert came to an abrupt end when the rain storm started. There was an abrupt change in the weather from sunshine to a thunder storm. 2. Surprisingly curt; brusque; such as, a quick answer made in anger: Leonard's abrupt reply hurt the couple's feelings. In an effort to avoid appearing abrupt in her mannerisms, the teacher smiled in a friendly fashion. Mike's abrupt answer was obviously made in anger and it hurt Jean's feelings. 3. Touching on one subject after another with sudden transitions: The speaker made abrupt references to several different topics during the few minutes he spoke. 4. Steeply inclined; having a sharp inclination; precipitous: The cliff made an abrupt descent to the sea. 5. In botany, terminating suddenly rather than gradually; truncate: a leaf with a shortened stem: The stem of the leaf became abrupt and narrowed close to the main branch of the tree. 6. Etymology: made up of ab-, "off" + rumpere, "to break", "to break off". 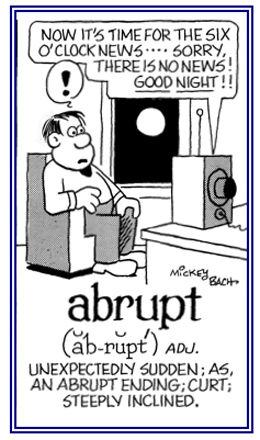 The past participle abruptus resulted in the English word abrupt, "broken off". In Modern English this meaning has been applied figuratively to the manner of a person who speaks or acts suddenly and curtly, or to things that change suddenly; "breaking off" unexpectedly. "Rupture" is an English word that still retains the literal meaning of "breaking", as do disrupt and interrupt, all derived from the same Latin "rump ere". An instance of suddenly breaking away or off: The accident caused a sudden and violent abruption of aircraft parts. A reference to or descriptive of something that takes place without warning: The party ended abruptly when the storm suddenly cut off the electricity. The trail for the donkeys ended abruptly and the tourists had to hike the remaining distance to the lookout point. 1. A localized collection of pus in part of the body, formed by tissue disintegration and surrounded by inflamed area tissue: Shirley had an abscess in her gums that caused her entire mouth to hurt. The dentist was gentle while he was cleaning out the abscess in Jeffery's wisdom tooth. 2. A circumscribed collection of pus usually caused by microorganisms: The doctor decided to lance the abscess on Ann’s leg so the pus could drain. In the hospital Joan had several abscesses on her body as a result of lying in the same position for too long. Abscesses can occur anywhere in the body, in hard or soft tissue, organs, or confined spaces; and because of their fluid content, abscesses can assume various shapes. The internal pressure of abscesses can cause compression and displacement of surrounding tissue, resulting in pain; however, it is part of the body's natural defense mechanism because it localizes infection to prevent the spread of bacteria. 3. 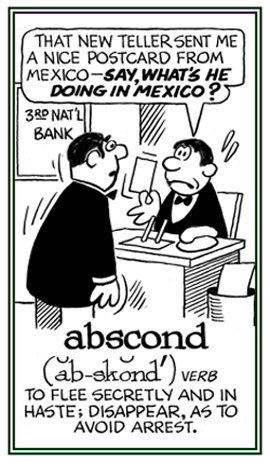 Etymology: from Latin abscessus, "an abscess"; literally, "a going away," from the stem of abscedere, "withdraw"; from ab-, "away" + cedere, "to go". The idea was that humors "go from" the body through the pus in the swelling. To sever or to cut off; to delete, to detach: Anna decided to abscind all communication with the dishonest supplier for her business. The document abscinds all the extra perks that the politicians were getting. The landslide abscinded the trail and the hikers were unable to complete their trip. Stephanie and Carolyn will be abscinding their relationship with the factory when the last order has been received. 1. The distance of a point from the vertical axis of a graph as measured parallel to the horizontal axis: The abscissa was highlighted in red on the graph. 2. In mathematics, the horizontal coordinate or x-coordinate of a point in a two-dimensional system of Cartesian coordinates: The abscissa is the distance from the vertical axis or y-axis measured along a line parallel to the horizontal axis or x-axis. In the statistics class, students were asked to explain the abscissa on the graph. The various abscissas on the chart were highlighted in different colors. 1. The act or process of suddenly cutting something off or a sudden termination: Jim's surgical abscission was neat and the wound was healing very well. The unexpected abscission of the speeches at the rally were welcomed by the crowd. 2. In botany, the normal separation of flowers, fruit, and leaves from plants or the natural process by which leaves or other parts are shed from a plant: In the fall, people can see the abscissions of the leaves as they fall from the trees and are scattered on the ground. The abscission zone is a layer of weak, thin-walled cells that form across the base of a plant part where the break eventually occurs. 1. To go away hastily and secretly; to run away and hide; especially, in order to escape from the law: Last night several prisoners absconded from the prison camp and disappeared into the dense fog. The goldsmith was absconding with all the gold that belonged to the customers; however, he was finally caught with a bag of stolen rings and necklaces. Yesterday afternoon, a thief was seen absconding with the neighbor's money and jewels. 2. 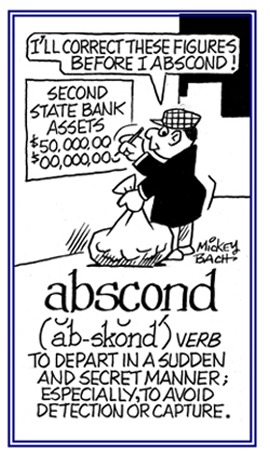 Etymology: from Middle French abscondre and directly from Latin abscondere, "to hide, to conceal, to put out of sight"; from ab(s)-, "away" + condere, "to put together, to store", from com-, "together" + dere, "to put". © ALL rights are reserved. Someone who gets away in a sudden and secret manner; especially, to avoid capture and legal prosecution: The police followed the trail of the absconder which led to the river where he was arrested. The robbery absconders took off with the money just before the police arrived at the bank where the money was stolen. While trying to solve the murder mystery, the police found a long list of absconders that could match the person they were looking for. 1. A situation in which someone, or something, is not available: The teacher noted Sarah's absence from class for the third time this week. 2. The time during which someone is away: Manual has had an excessive number of absences from school this month. 3. That which is lacking or desired: Curtis was accused of having an absence of leadership as well as an absence of initiative. 4. A condition in which someone is inattentive or not paying attention: Catherine and Frances noticed that the periods of absences of their friend's mind seemed to be increasing. 5. 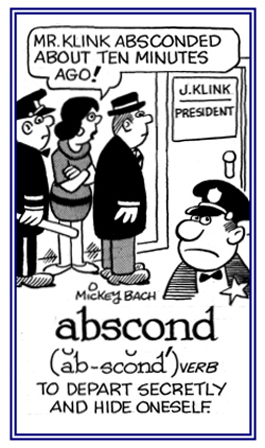 Etymology: from Old Frence absence (14th century), from Latin absentia, absentem (nom. absens), present participle of abesse. "to be away from, to be absent"; from ab-, "away" + esse, "to be". A reference to not being present, to be away from a place: James, why were you absent from work yesterday? David gave Julia a very absent stare as if he didn't understand what she was saying. Showing page 8 out of 13 pages of 191 main-word entries or main-word-entry groups.